I’ve been a little busy, so you haven’t seen anything from me in this space for awhile. What I have been working on? A new company called Assabet Interactive that provides software to libraries to make it easier to serve their public on their websites. My interest in design—in the biggest sense of the word—was what led me to form a partnership with a programmer to fill a need we saw as unmet: the clean, intuitive delivery of functionality around an event calendar with registration, meeting room reservation, and museum pass check-out on library websites. Assabet Interactive was just at the New England Library Association in Danvers, Massachusetts to announce that, after almost two years of talking to librarians, designing an approach, and building out the modules with a common administration section, we are ready to deliver on our promise of tools that make it easier for both patrons and staff to engage in some of the core services every library provides. 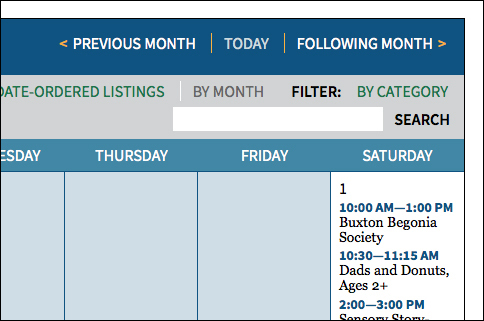 You can see our calendar and room reservation system on the Goodnow Library site. In subsequent posts, I’ll go into some of the details that make our software different. And, off course, comments on some of the interesting music and art I encounter. Charlie Gaylord on Some Words, What Meaning?